Rabbi Yehoshua Yeamans was appointed Rabbi of Congregation B’nai Israel Ohev Zedek in August 2015. Prior to this, Rabbi Yeamans served as the Assistant Rabbi of the Beth Israel Synagogue in Edmonton, Alberta, where he worked to invigorate adults, teens, and youth through warm rabbinic leadership and innovative learning programs. Rabbi Yeamans grew up in Scarsdale, New York. After two years of learning in Yeshivat Kerem B’Yavneh in Eretz Yisrael, Rabbi Yeamans spent eight years learning in Yeshivas Ner Yisrael, where he received his Semicha in both Orach Chaim and Yoreh Deah. In addition to his rabbinical degrees and training, Rabbi Yeamans earned his Masters in Business Administration from Loyola University in Baltimore, Maryland. While living in Baltimore, Rabbi Yeamans received rabbinical training from Rabbi Moshe Hauer, the Rabbi of Congregation Bnai Jacob Shaarei Zion. Additionally, he received practical rabbinic training from the National Council of Young Israel, and the Star-K. 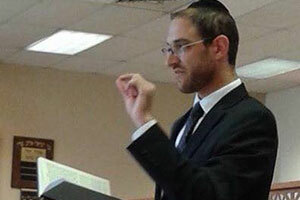 Rabbi Yeamans also served as the rabbinic intern at Young Israel Shomrei Emunah in Silver Spring, Maryland and at Congregation B’nai Jacob Shaarei Zion in Baltimore. Throughout this time, Rabbi Yeamans also founded and directed Camp Sports Kollel, a post-high school learning and sports camp on the campus of Yeshivas Ner Yisrael. Since his arrival at B’nai Israel, Rabbi Yeamans has brought an array of engaging shiurim, inspirational drashos, popular learning and social programming, and expanded shul engagement throughout the community. He continues to provide caring leadership and pastoral guidance for our congregants and their families. Rabbi Yeamans is married to Rebbetzin Sarah Yeamans, originally from Philadelphia, where she graduated Politz Hebrew Academy and Torah Academy Girls High School. After attending seminary in Israel, Sarah served as a Judaic Studies teacher for girls high schools in both Philadelphia and Baltimore, and earned her Masters in Speech-language pathology. She holds specific training in the teaching of Taharas Hamishpacha and offers engaging shiurim to the women in our community. The Yeamans have three children—Moshe, Akiva, and Ahuva. To Contact Rabbi Yeamans, please email rabbi@biozshul.org or call 215-954-8210.